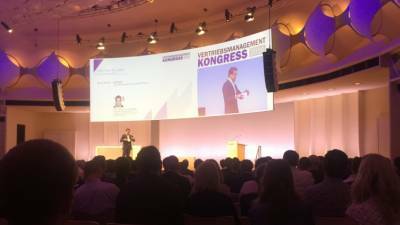 Earlier this month eobiont attended the 3rd annual Sales Management Congress in Berlin, the largest professional event of its kind in Germany. This year’s theme: The Future of Sales Management. BdVM-Präsident Thomas Lang explained in his opening speech that this was chosen in part because the future is not what happens, rather it is up to the individual to create it. Presentations focused on globalization, incentives, digitalization and leadership to inspire and prepare participants to take the right steps and point their business models in a relevant direction. We appreciated the contribution of Dr. Susan Hennersdorf, general manager of EnBW Energie Baden-Württemberg AG. In her talk, “What motivates people to go the extra mile – incentive systems in cross-sectional comparison,” she discussed the best practices for team motivation, based on her own experience. Of course, showing appreciation and giving recognition are predictably high on that list, but she also shared her experience with performance-based compensation and the impact that team success vs. individual success has on an organization. Hennersdorf also stressed the importance of setting a good example as a team leader. The more positive energy you bring to your project and the more you can show what motivates you to come to work in the morning, the more that will be mirrored in the members of your team. We’d like to add, good coffee helps, too.